What’s the Value of 5 Minutes of Labor in Your Supply Chain Operations? Labor is the largest single cost in your supply chain manufacturing, distribution and retail operations…and it represents a major opportunity for cost savings. 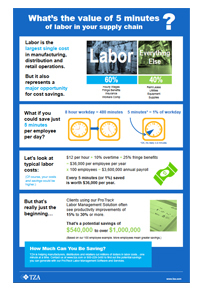 Do you know the value of 5 minutes of labor in your supply chain operations? Our infographic walks you through the math to show what saving just 5 minutes can mean to your bottom line. Of course, you’ll want to use your own wage and benefit costs to find out your real potential savings. And then you can contact TZA to find out how we are saving hundreds of clients millions of minutes every year.